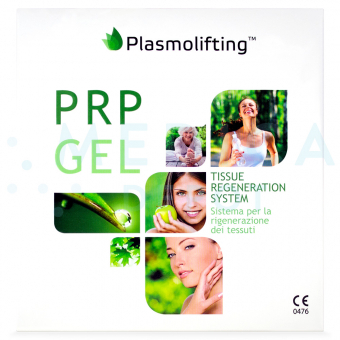 Plasmolifting PRP Gel is a kit that helps to extract and isolate platelet-rich plasma (PRP). PRP is a concentrate derived from whole blood which contains a higher proportion of platelets together with its associated growth factors and cytokines, and is used in aesthetic medicine as an anti-aging treatment. With this kit, high quality autologous PRP can be processed quickly and simply for immediate treatment. Plasmolifting PRP Gel is a kit for preparing PRP for injections. 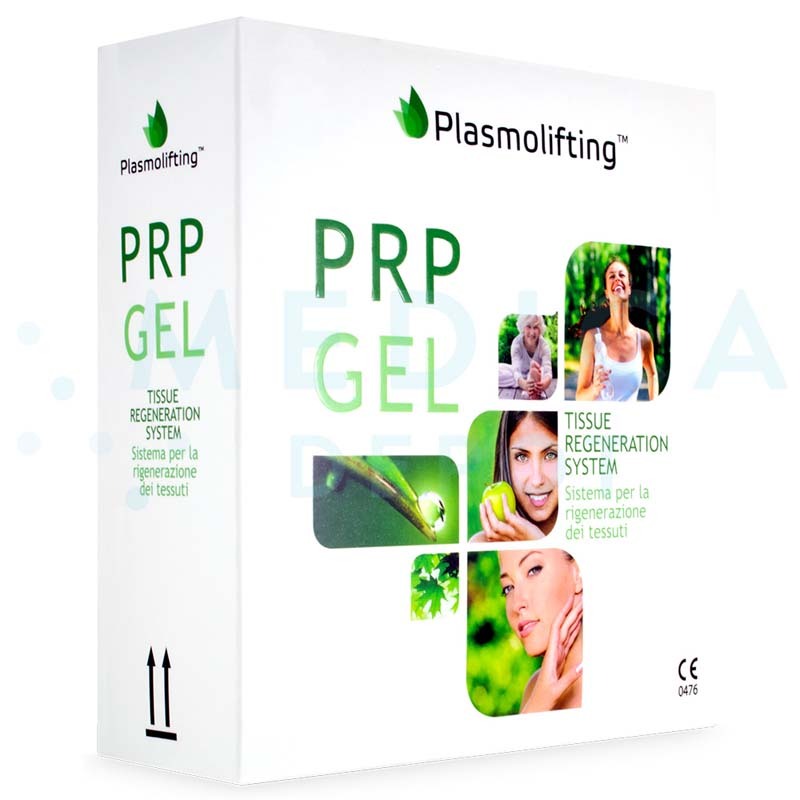 You can order Plasmolifting PRP Gel online from MedicaDepot.com or by calling our friendly customer service associates. When you buy wholesale Plasmolifting PRP Gel from Medica Depot, you can speedily and simply process your patient’s blood to acquire high quality PRP that will provide optimal treatment outcomes. 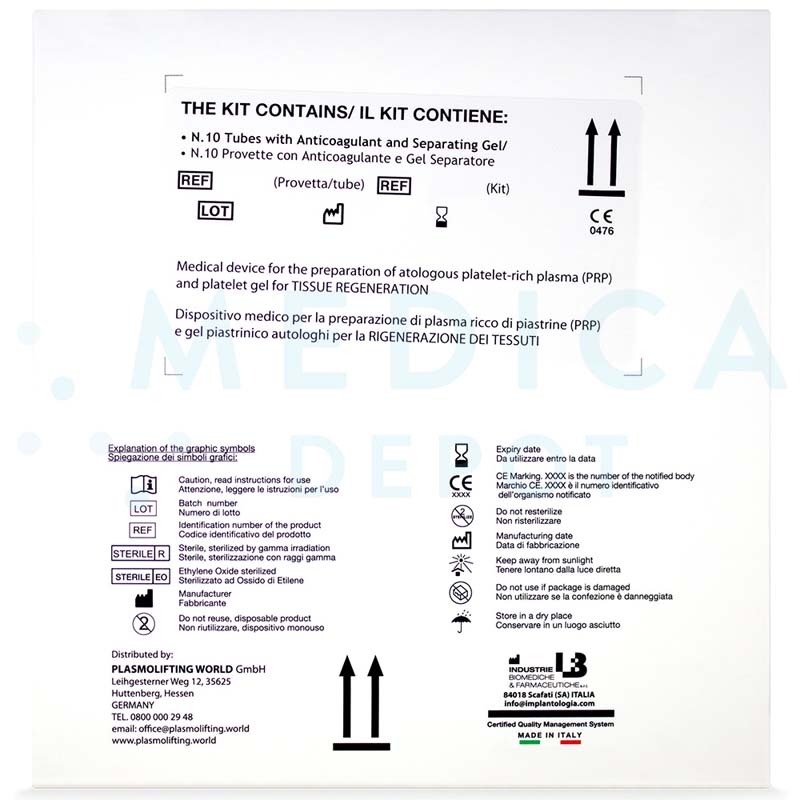 This kit provides tubes specially designed for processing whole blood samples taken from a patient to obtain autologous PRP, a material with demonstrated tissue repair capabilities. The protocol used with this kit is simplified with a single centrifugation step so that it can be accomplished quickly and easily without the need for expensive lab equipment. PRP therapy makes use of platelet-rich plasma (PRP), a concentrated preparation of the patient’s own platelets suspended in a small amount of blood plasma. Along with the higher concentration of platelet cells, PRP also contains an increased proportion of growth factors and cytokines associated with the blood cell, including platelet-derived epithelial growth factor and vascular endothelial growth factor. These function to modulate cell proliferation, tissue remodeling, angiogenesis and inflammatory responses, and gives PRP attributes that lend to its potential for wound healing and tissue regeneration. The Plasmolifting PRP Gel kit provides blood collection tubes that easily separate the desired PRP portion of whole blood from its other constituents through a single centrifugation step. The final product is ready for administration to the target areas. 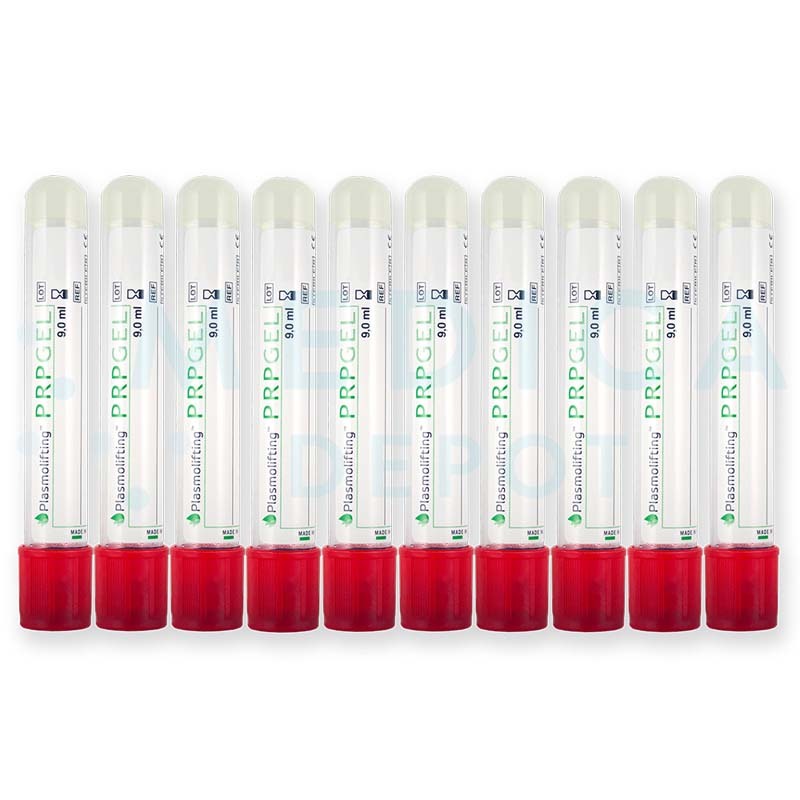 Plasmoliftitng PRP Gel contains 10 x 9 ml borosilicate glass vacutainer tubes, each containing a blood anticoagulant and proprietary thixotropic separating gel. Prepare the patient for blood collection by disinfecting the venipuncture site and applying a tourniquet. Attach the needle into the vacutainer holder. Place the Plasmolifting PRP tube in the vacutainer holder. Insert the needle into a vein. Push the tube in the sheathed end of the needle to begin blood collection into the vacutainer. Draw 9ml of blood from the patient. Complete blood sampling by removing the tourniquet and withdrawing the needle. Apply a bandage or clean gauze and tape to the site. Dispose of the needle and holder, and other used consumables. Invert the tube five to six times to ensure proper mixing of the blood with the tube additive. Create a “balance” tube by filling an empty tube with an equal volume of water to the sample tube. This tube should be placed at the opposite end of the sample tube in the centrifuge. Perform centrifugation for five minutes at 4000rpm in a fixed-angle rotor centrifuge. After the centrifugation step, the blood sample should form distinct and segregated layers: a layer of clear fluid (Platelet-poor plasma - PPP), a second layer of platelet-rich plasma (PRP), a thin layer of "buffy coat", the separating gel and lastly the red fraction made of red blood cells. The desired layer is drawn with a syringe, ready to be used on the patient. The prepared, autologously derived PRP suspension is administered to the desired treatment area through injections with a 30G disposable needle. Depending on its application, PRP injections are given in two to ten sessions in intervals of seven to ten days. When using PRP for skin rejuvenation, the material may be used on the skin of the face, neck, décolletage, and the back of the hands and feet. PRP therapy can provide results that last up to 18 months, depending on the application and treatment area. PRP therapy is suitable for patients who are looking for a non-invasive injectable to improve the appearance of wrinkles, age spots and other signs of aging. As PRP is an autogenous preparation, PRP therapy is well-tolerated by patients. PRP kits like the Plasmolifting PRP Gel allow for a quick and easy processing of their patient’s blood to provide therapy in a timely manner. This protocol makes use of a common lab instrument to generate high quality concentrated platelet-rich plasma that can be used for various indications. After PRP therapy, patients may experience certain injection-related reactions at the treated site, such as swelling, inflammation, bruising, tenderness and itching. These effects should subside and resolve within a few days.